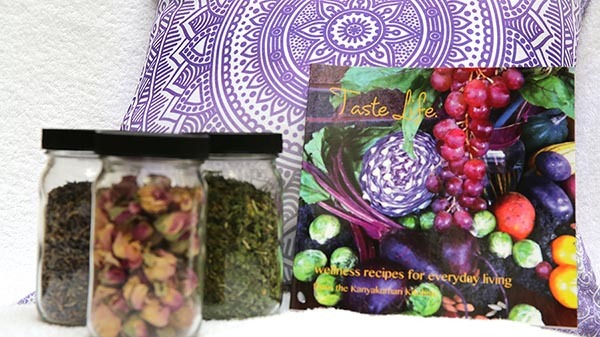 Great Primer of a Cookbook for those who are new to Ayurveda. It contains explanations of the health benefits of all the herbs & spices, directions on how to make ghee and paneer, beverage recipes like teas, yogurt drinks, rejuvenative drinks, soups, breads, breakfast recipes like paneer breakfast wrap, and immune support cereal, chutneys, vegetable dishes like New World Chopped Vegetable Salad, Main dishes like kitchari, and polenta lasagna, desserts & snacks like Sunball Sweeties and Crunchy Savory Snack …. Purpose –Easy, yummy, warm breakfast recipe. Can be used in a cleanse. Soak moong beans overnight, rinse beans well. Cook moong beans with vegetables and water until very soft. Mash beans with blender or food processor and add back to pan. Heat oil/ghee in a small pan, add cumin, then grated ginger, sauté lightly. Add this oil mixture to soup. Then add salt and spices. Mix, and bring to a low boil for 2 min. Remove from heat, add lemon juice. Eat only the broth part of the soup that is sitting on top of sediment at the bottom of the pot. When done with the broth, discard the sediment, and make a new batch the next day. When they are evenly mixed, begin adding your powdered herbs – add about 1-2 ounces at a time, stir them in. After your powdered herbs are evenly mixed in, add some ingredients for texture and added flavor and stir until the mixture gets to a formable consistency (remember that you want to be able to form balls). Use your hands to roll pieces of the mix. Once the balls are formed, feel free to roll them in some shredded coconut, hemp seeds, cocoa powder, or even dip them in some bittersweet dipping chocolate.